Have you ever struggled to understand why your ad is performing the way it is? Or better yet, which part of the ad is driving its result – and how you can duplicate (or avoid) it in future development efforts? If so, then we have the perfect solution, and it utilizes our validated CCPersuasion metric that has been proven to predict in-market Marketing Mix Modeling results. Our solution is an exercise we call Scene-To-Scene, which is available in our Touchpoint Plus methodology. It involves splitting the ad into its constituent “scenes” and then gauging positive and negative interest for each of them. By taking this data and crossing it with our CCPersuasion exercise, we are then able to establish which parts of the ad are actually having the most impact on the ad’s effectiveness – both positive and negative. The first four scenes feature the opening drama, which parallels with the idea of switching from more traditional cable to DirecTV NOW – it includes an actress portraying a girlfriend who is throwing her soon-to-be ex-boyfriend’s belongings (including his traditional cable box) onto the front sidewalk. Each “scene” includes a line from the ad so we are able to assess them individually – as well as collectively – if desired. Scene 10 is an ending tag with the call-to-action to the website. While we do not necessarily expect the tag to generate a ton of interest, this allows us to check and make sure that is the case. As we expected, the opening drama in the first half of the spot received very polarizing responses – with a couple scenes actually receiving more negative interest (red) than positive interest (green) agreement, such as scenes 1 and 3. Others are netting more total attention, but still with substantial negative reactions, such as scenes 2 and 4. 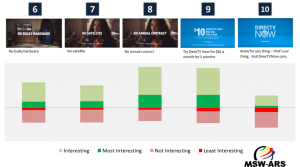 Scenes 8 and 9, which talk “no annual contract” and “$10 a month for 3 months,” respectively, receive by far the most favorable responses of any individual scene in this ad. As we likely expected, this verifies scenes 8 and 9 are powerful in driving the persuasive power of this spot – combining for half of the result and being far and away the most impactful scenes. However, this also shows data we may not have expected with the opening drama. 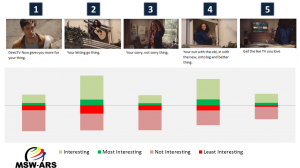 Scenes 1, 2, and 4 – which all involve the girlfriend actively “throwing out the old” – all return around 10% of this ad’s persuasion power apiece – meaning that even though they were not necessarily receiving significantly higher positive responses than negative responses, they are still valuable to the spot – especially setting up interest in the product benefits. Scene 3, which appeared to be similar to Scene 1 on the qualitative scale, is actually not nearly as powerful in driving viewers to DirecTV NOW. This scene is different in that it is a break from the action and the “sorry, not sorry” line is also a break from the definitive change message of the other opening scenes. Scene 5, which talks “live TV,” does not appear to be very powerful either qualitatively or in driving CCPersuasion, but perhaps is a necessary set-up line to explain what DirecTV Now is, as opposed to on-demand streaming services such as Netflix. And while the “no bulky hardware” and “no satellite” scenes achieved fairly decent qualitative feedback, we can see that they really do not compare to the two scenes that come directly afterward (8 and 9) in terms of driving CCPersuasion. Thank you for reading. We hope you enjoyed this blog entry – and please look out for more in the future. For more information on how our communications research tools can help improve your advertising’s effectiveness, please contact us at aklein@msw-ars.com.